Either system is subject to limitations. Floating the tuner does not guarantee freedom from common-mode currents that defeat balance. A 4:1 balun often reduces the already low impedance at the antenna terminals to a still lower one, and high reactances are normally unfriendly to the cores used in such baluns. It is possible to build perfectly usable balanced network tuners. However, the parts count goes up, and ganging the components often presents further building and size difficulties. However, in the search for an ATU design that will handle balanced lines naturally, balanced PIs and Tees should not be overlooked by adventuresome home builders. A simple 1:1 balun on the transmitter side converts the resistive balanced input load to the unbalanced line for which the transceiver is designed. To make a balanced network, chose a good unbalanced network as a model. Look at the series elements. Put one in each line in corresponding positions, but use half the reactance. For a coil, that is half the inductance; for a capacitor, that is twice the capacitance. Now look at the shunt component(s), those from the series line to ground in the unbalanced network. Use the same value across the two lines of the balanced network. This simple conversion leaves the system center floating, but that is rarely a problem. Do not forget to add the balun (1:1, 50 ohms) at the input. And remember that there is no safe place to put your finger when the system is hot. A more classic alternative is the link-coupled or inductively coupled ATU. The figure shows the basic circuitry. The unbalanced input is inductively coupled to the main inductor. Since the mutual inductance between the coils is critical for maximum efficiency, the coupling is varied either by a movable link or by a series input capacitor. The output is shown in a typical parallel configuration. To effect the best match, clips are provided to connect the line to the proper turns on the main inductor, as determined by maximum feedline currents. The split- stator capacitor or dual ganged capacitors can be connected to ground so that the system is balance with respect to system ground, as shown at *. However, the tuner will remain balanced if the ground is lifted. The ** point indicates that the rotators of the capacitors may be separated and lifted from ground. In this case, they can be connected to the output terminals instead of using a coil tap. For further flexibility, the stators can be connected to various taps on the coil for maximum output. This configuration, often called the series connection, permits efficient matching to low impedances presented at the output terminals of the ATU. To the best of my knowledge, no one in the U.S.A. is currently producing such a tuner commercially. Chapter 25 of recent ARRL Antenna Books has a simple tuner with some limitations in link-main coil coupling efficiency, but not a bad start. The only commercial unit I know of was made in Germany until just recently. Despite their relative scarcity, link-coupled tuners have certain advantages over all other tuners. First, they are inherently designed for use with balanced feedlines. Second, they exhibit very low losses, even at high power levels with reasonable care of construction. Third, they can be configured to almost any balanced line condition that might face the operator. However, they also have certain disadvantages. First, they do not lend themselves to automated or rapid changes in setting and configurations as one changes bands. Second, they work best when equipped with plug-in coil sets that permit the most optimal coil-link size ratios. A network tuner provides the most efficient match when its variable components are truly variable rather than switched. This principle applies especially to the inductor. A switched inductor may provide a 1:1 match at one or more settings, but it does not necessarily permit the use of the most efficient (lowest loss) setting of the coil. Likewise, a single coil and link for all HF bands does not provide the best coupling ratios for all possible conditions. Without provision for coil tapping and series connections, the most efficient operating mode may be inaccessible, despite a 1:1 match. For a "hurry-up" operator, these inconveniences may be worse than the losses inherent in current systems pressed into balanced-line duty. However, for operators seeking the most efficient transfer of power to balanced lines, nothing beats a properly designed and constructed link- coupled ATU. I have been forwarding the survey results to sources. I have recieved to date over 200 notes, equally split between low and high power units--with some wanting both. This is not a bad return for a casual item at a non-commercial website. It indicates a strong market potential, even if not quite of the size for new 2-meter handhelds. I have heard the Johnson Matchbox described as a modified Z match, which is not quite right. Having just obtained one, I thought I might describe the circuit, which appears to be very similar to the link coupler offered by Annecke in Germany. The circuit is a straightforward link-coupled circuit. The input with the relay and associated circuitry includes taps for a 50-ohm transmitter connection and a 300-ohm receiver connection, since receivers continued to used balanced input strips long after transmitters had gone to shielding, pi networks, and 50-ohm outputs. 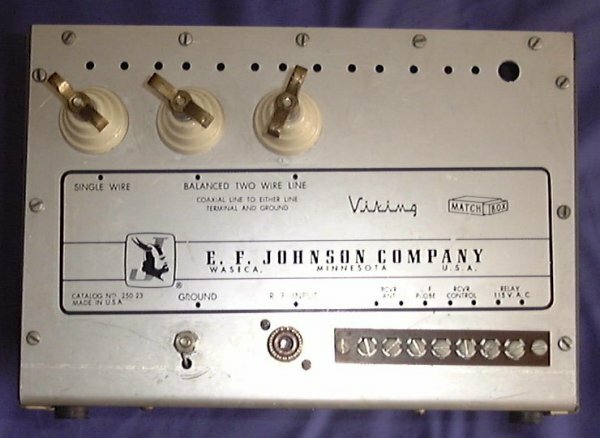 The Johnson Matchbox uses a single link for all bands with no variability. The Annecke design does away with the relay, receiver tap, and other pre-50-ohm transceiver features. Instead, it uses a larger (overcoupled) link with taps for the various bands (80, 40, 30-20, 17-15, and 12-10) mechanically linked to the secondary coil tap switches. In addition, it employs a series variable capacitor to adjust coupling (or input impedance, which amounts to the same thing). The Annecke design is superior in this regard. The secondary systems of both the Matchbox and the Annecke are almost identical, differing only in output connection options. The secondary coil is tapped at reasonable positions for 80/40/20/15/10 meters, shorting out the unused turns toward the outer ends. Although the Annecke is marked with the preferred settings for the WARC bands, Matchbox users will have to experiment on these bands. 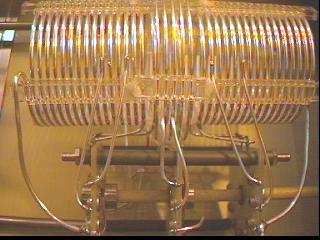 Across the outer limits of the coil is a split stator capacitor, center grounded, which is used to set the tank at resonance. The required value of capacitance will vary somewhat as the reactance and resistance at the antenna terminals is varied. The terminals are not connected directly to the outer limits of the tank. Each side of ground passes to a differential capacitor. The center of each differential goes to the antenna terminal. A differential capacitor is a split stator variable arranged so that as capacitance on one side goes up, it decreases on the other. The antenna terminal on each side of ground is thus set at a certain reactance from ground and certain series reactance from the tank. This arrangement forms a voltage divider. It also forms a means of compensating for reactance at the antenna terminal of the tuner, allowing it to match a wide range of R+/-jX combinations that might be present at the antenna terminals and still present the requisite high impedance to the tank circuit ends. 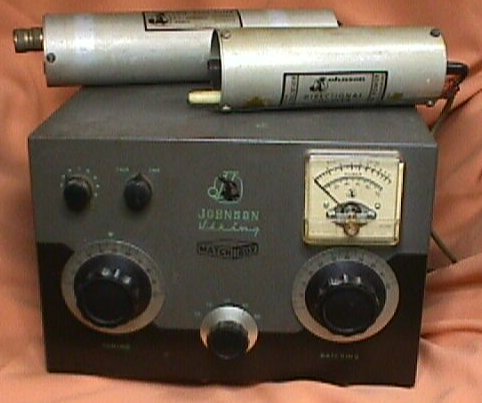 The design goes back to AM days, so the 275 watt rating is likely not only conservative, but conservative to the power of the carrier plus side bands of a 100% modulated AM signal. Capacitors appear to be spaced for at least 3 kV or better. The KW matchbox uses the same circuit with beefed up components and only some slight connection changes. 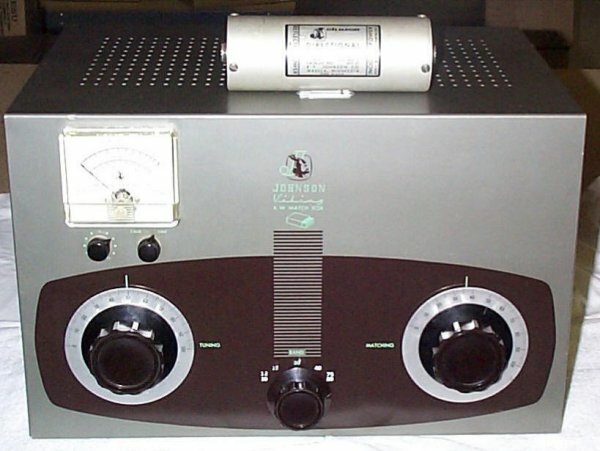 The Annecke unit is rated at 200 watts and appears (from the photo of the case and the control arrangement) to use slightly lighter components than the Johnson, even though the 200 watt rating is also conservative. Perhaps the only thing I would do to improve the design is not mechanically feasible: to have a rotary coil with contra-rotating sections (in line) to permit the full span of taps in order to eliminate the switch. The goal is to make available the most efficient coil settings for every possible set of R+/-jX presented, but I have no idea of how to make that work mechanically and preserve the center link and main coil center efficiency. I thought those who have never seen a Matchbox might be interested in the basic design. (Love those elegant Johnson panel colors used after about 1960, similar to the colors on my own QSL, but not intended that way.) I have come across two photos, one of the 275 watt unit without meter for SWR through the external directional coupler, and the other with the available couplers on top and the meter in place. The difference in the panel lettering is a clue as to which is older and which is younger. The rearside detail is also interesting for those who might wish to home brew a link tuner or for those wishing to know what to expect from the unit. Jan Axing, SM5GNN, provided photos of the rear of his unit, which does not have the coupler. My thanks for his thoughtfulness. The 275-watt Match Box is about 10" wide, 10" deep, and 7.5" high. 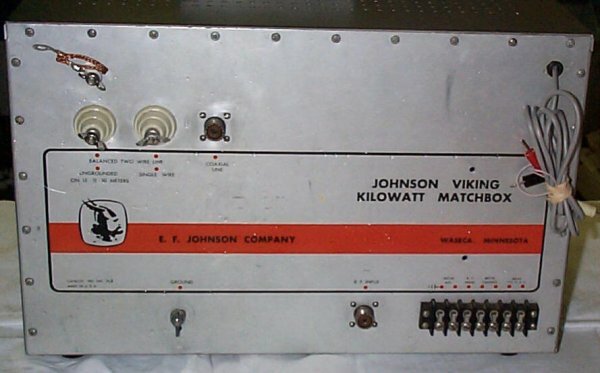 The circuitry of the KW version of the Match Box is virtually identical to that of the smaller 275 watt version, although considerably beefier. 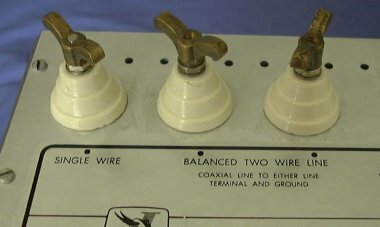 Instead of a ceramic terminal for single-ended antennas, there is a coax connector. For identificatioin purposes, here are photos, front and back, of the KW Match Box, but they appear to be of different units. The front shows the later paint scheme, while the back shows the earlier logo without the "J" behind the Viking. You can gauge the relative size difference between the 275 watt and KW versions from the directional couplers on top of the respective units. My thanks to Peter, SM5HUA, for the photos. A copy of the Johnson Manual--used for both sizes of the Match Box--can be obtained from K4XL's BoatAnchor Manual Archive. Courtesy of Jan Anker, ON4CAF/PA0LBN, I can show something of the inside of the Annecke unit. 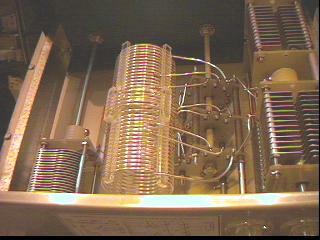 The first photo is of the inside from the bottom rear, showing the split-stator tuning capacitor to the left. The input tuning capacitor is to the right. The second photo is of the interior from the top rear, showing the differential capacitor to the right (with the input capacitor nbow to the left). Since the two large capacitors are vertically aligned, a single photo cannot show both. 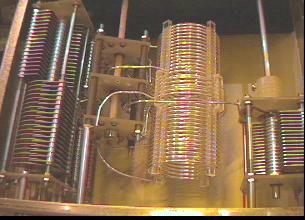 The last photo is of the coil assembly, which is remarkably similar to the scheme used in the Johnson Match Box. For maintenance of circuit balance, symmetry is essential. The 200-watt Annecke unit is about 5" high, 10" deep, and 12" wide. Personally, I would have left a bit more room in the cabinet to reduce stray capacitance, but I certainly would not refuse to use the Annecke unit. 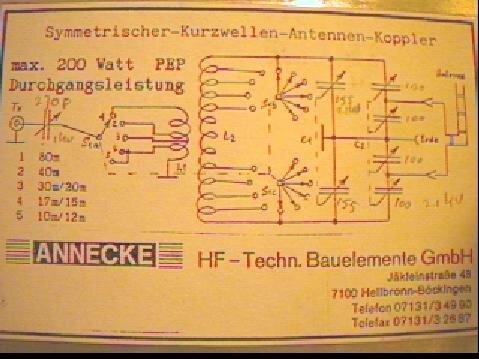 Again, courtesy of ON4CAF/PA0LBN, here is a photo of the schematic on the back of the Annecke unit. In case the cvalues are hard to read, the split stator os 155 pF per section, the differential is 100 pF per section, and the input capacitor is 270 pF. One bad habit of all antenna tuner makers is to list a simple impedance range for the antenna matching capabilities, for example, 50-3000 ohms for the Annecke. 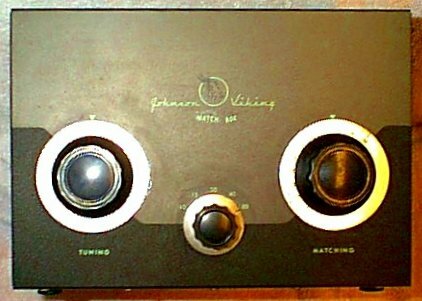 Actually, the ability of any tuner to effect a match is determined by the combination of R and jX at the antenna terminals. Whatever the reactance-compensating scheme, it will have some limitations, usually being more effective with large values of either jX or -jX, but not both. Moreover, the range of impedances for which any given tuner design can achieve maximum efficiency is ordinarily quite a bit narrower than for achieving a mere 1:1 SWR on the transmitter side. However, bringing the impedance presented to the antenna terminals within the range of the tuner's maximum efficiency potential is usually only a transmission-line length change away. Updated 5-23-99. � L. B. Cebik, W4RNL. Data may be used for personal purposes, but may not be reproduced for publication in print or any other medium without permission of the author.